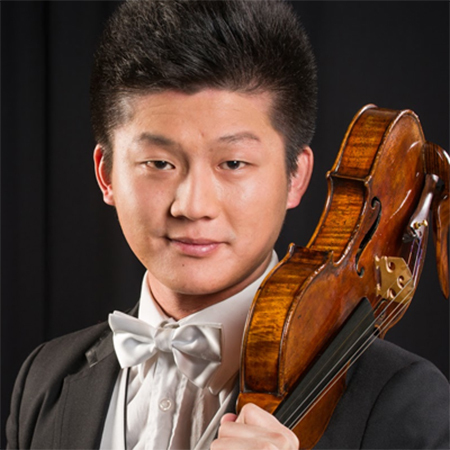 Born in Hong Kong, Samuel Tsui began learning the violin at the age of 5 and continued his studies in Canada, where he completed his ARCT diploma. He was awarded a full scholarship to further his music education at the University of British Columbia, attaining both his Bachelors and Masters degrees specializing in violin performance under the tutelage of Jasper Wood. During his studies, Samuel was frequently appointed concertmaster of the University of British Columbia Symphony Orchestra, and was awarded various scholarships and performance opportunities. Post-graduation, he further developed his abilities under the mentoring of Akira Nagai. Past influences also accredit Lin Hui Chuang, Tin Sun Pang, Yu Wu, Gong Qin and Sao Duk Du. Acquiring over a decade of teaching experience, Samuel has worked with students of all ages. He regularly coaches string sectionals for the Vancouver Youth Symphony Orchestra, Surrey Youth Symphony Orchestra the Richmond Delta Youth Symphony Orchestra. During the summer, he serves as a faculty member of the Music, Meadows and Mountains retreat in Washington, USA. Samuel intensively prepares his students for all types of opportunities and caters to help achieve their goals. Under his instruction, his students have achieved marks of distinction in RCM examinations, participated in various music festivals, competed in the CMC and Kiwanis competitions, and have successfully auditioned for placements in youth symphonies, including the VYSO, RDYO, and Lions Gate Youth Orchestra. Alongside teaching, Samuel currently performs as the principal second violinist of the Vancouver Island Symphony Orchestra, and is a member of the first violin section in the Kamloops Symphony Orchestra, Canada West Chamber Orchestra, and the Willingdon Church Orchestra. He also served as the personnel manager and a first violinist of the Vancouver Metropolitan Orchestra. Samuel has become a well sought-after violinist in western Canada, where he has been invited to perform and record for various high-profile occasions and has worked with notable artists including Michael Bublé, Mariah Carey, and Mary J. Blige. He has also adjudicated for the junior, intermediate and senior instrumental divisions of the Richmond Music School Scholarship Competition and the String Festival of Central Valley Academy of Music. In addition to English, Samuel is also fluent in Cantonese, Taiwanese and Mandarin.